A three judge panel from the Ninth Circuit U.S. Court of Appeals ruled that aerial deposition from the Teck smelter in Trail, Canada does not constitute “disposal.” As such, Teck cannot be held liable for hazardous substances such as lead, arsenic and mercury emitted from Trail smoke stacks that traveled through the atmosphere and then deposited in the Upper Columbia Valley. Washington State and the Colville Confederated Tribes brought the case to hold Teck liable for cleanup costs and natural resource damages under the Comprehensive Environmental Response, Compensation and Liability Act, or CERCLA (also known as superfund). The court relied heavily on two precedents that parse the meaning of “disposal of waste” under CERCLA. In one of the precedents, the ninth circuit ruled that BNSF Railway emitting diesel particulate matter into the air that resettled onto the land and water did not constitute disposal of waste and thus not subject to liability under CERCLA. News reports indicate plaintiffs will petition for a new hearing before the full 9th U.S. Circuit Court of Appeals. Potentially, the case could be heard by the U.S. Supreme Court. Under terms of a 2006 settlement agreement between EPA and Teck, Teck has funded soil sampling and remediation related to atmospheric deposition in the Upper Columbia Valley. In 2014, EPA sampled 74 residential properties which led to cleanup on 14 properties. This year, 142 property owners granted access for soil sampling that begins this month. Click here for a National Law Review article reviewing the case and its implications. NESPELEM—This week Teck Cominco’s failure to manage its operations has once again sent toxic pollution into the Columbia River. It is another tragic assault by Teck on the region’s natural resources. Teck’s disregard for the land, air and water it impacts must be stopped. Our Tribes have taken action to force Teck to step up to its responsibility and the spill this week unfortunately highlights Teck’s ongoing failure to stop polluting and start cleaning up decades of waste in the U.S. The river is the natural resource and cultural lifeblood of the Colville Tribes and must be protected and restored. For nearly a century, Teck pumped slag, a toxic byproduct of metals refining, directly into the Columbia River. More than 10 million tons of the granular slag created the “black sand” beaches of the Upper Columbia, a 150-mile reach of the river between the Canadian border and Grand Coulee Dam. Regulatory and legal processes will continue to guide the cleanup, but there can be no more delay in action. Several efforts to reintroduce migrating fish in the Upper Columbia are moving forward. It is critical that the sediments in the Upper Columbia be cleaned up to ensure those runs have a healthy food chain on which to thrive. Only cleanup will create that opportunity. Recently I received questions from a concerned Northport resident regarding land value, livestock permits, economic value, and air and water quality; in reference to the EPA/Teck Upper Columbia Studies and Clean-up. I forwarded those questions along to our EPA Project Manager, Laura Buelow. Laura, Kay Morrison, (Community Involvement Coordinator), and Marc Stifelman, (EPA Toxicologist), responded to these questions. I found both the questions and answers informative and wanted to share them for any other interested Northport residents. Below are the questions submitted from the Northport resident, and the EPA’s answers. Q: How does this affect the value of the land for taxes, finance, appraisals, selling? Q: Are people having problems selling land due to the contamination? A: We have heard that property is being sold, but don’t have any details past that. Q: Is there a land conservation group willing to purchase the land at fair market value? Q: How can you sell the land if there is contamination – are we liable for the contamination for the next owner? Who pays for the testing? Who is responsible for the clean up now and in the future? The testing is being paid for by Teck American, Inc as part of the remedial investigation/feasibility study. The testing in 2016 will be conducted by Teck and their contractor, with oversight by EPA. The soil clean ups that were performed in 2014 were paid for by Teck and conducted by Teck’s contractors with oversight by EPA. If additional soil clean ups are necessary, the landowner will not be responsible for the cost. Q: Future clean up – how many years for re-testing? Who pays for the testing and clean up in the future? A: We’ll determine if, and where, additional areas need to be sampled based on the 2016 study. We can’t guarantee that we’ll do another round of testing, and we don’t have additional residential soil sampling scheduled out past 2016. Q: Is the ground becoming contaminated via air – water? A: EPA believes the data shows that the soil became contaminated from historic smelting operations at the Trail smelter, specifically the metals coming out of the smelter stacks (air). The smelter has been in operation since the 1890s. In the 1990s, the smelter went through a major improvement and the air emissions significantly decreased. We have received requests from the community to perform air monitoring and we are looking into the existing data to determine if additional air monitoring is necessary for the remedial investigation/feasibility study. Our focus right now is getting residential properties sampled. Q: Can we produce and sell food/livestock raised on contaminated field? I read that we have to get a special permit for that? A: Individual soil sampling results would need to be discussed specifically with Laura Buelow, EPA Project Manager (buelow.laura@epa.gov). Q: If so, does the produce/livestock have to be tested? Q: How often is either tested? How do we get theses tested? Q: How can the community develop future economic bases? How can we draw companies here? A: This is outside the scope of our work at this stage of the study. There is an organization called the Tri-County Economic Development District (http://tricountyedd.com/ ) that serves Northeast Washington – Ferry, Pend Oreille, and Stevens Counties. Q: What studies are being done on the wildlife and vegetation and the affects of the pollution has on them? Forest health? A: The ecological risk assessment is part of the RI/FS and it will determine if there is any issues with the plants and animals. Q: There seems to be a lot of studies done at universities – are any doing studies here? Q: How many groups are involved with this? Coordination? Meeting Schedules? Funding? Accountability? A: EPA and Teck signed a Settlement Agreement in 2006, which is a legal contract that sets out how the study will be conducted. Teck funds all of the work. EPA also has an agreement with the U.S. Department of the Interior, Washington Department of Ecology, the Colville Tribe, and the Spokane Tribe to participate and provide input on all of the sampling plans and documents. Teck funds these parties as well. There is also the Citizen’s for a Clean Columbia (the CCC). They have a technical advisor and Teck funds the time for the advisor. EPA has had community meetings in Northport approximately every 6-8 months for the last 3 years, mostly focused on the soil sampling. Q: Is there a early warning system in place that goes out to the residents when pollutants are released in the river? Like a reverse 911. A: Ecology receives the notice of spills from the Trail smelter. Q: How come the fines Teck pays to Canada for environmental discharges are not distributed to the US? A: I’m not sure what these fines would be. Teck is paying to all of the remedial investigation/feasibility study. In 2008, along with the non-profit group Citizens for a Clean Columbia (CCC), I began reaching out to past and present residents of Northport, WA. After a year of researching the Environmental Protecton Agency (EPA), Dpt. Of Ecology, Dpt of Health (DOH), and the Agency for Toxic Sustaces and Disease Registry (ATSDR) studies conducted in the Northport area, I discovered information so unthinkable I really didn’t believe it to be true at first. The studies of the U.S. Government Agencies, mentioned above, were of interest to me because they were in regards to the century of heavy metal toxins Teck Cominco had dumped into the Columbia River, and into our air. Teck Cominco, now Teck Resources, is a Canadian lead and zinc smelter located 7 miles from Northport, 3 miles upriver, in Trail, Bristish Columbia. The slag and air emissions they had sent our way are the by-products of the process Teck uses to smelter the lead and zinc ores. They contain heavy metal toxins such as arsenic, cadmium, lead, mercury, and sulfur dioxide, just to name a few. What I discovered in these US agency investigations and reports is that since before 1940 thru 1997 Teck Resources dumped an estimated 9.8 million tons of slag (heavy metal toxins) directly into the Columbia River. This is the equivalence of a dump truck emptying 19 tons, every hour, for 60 years. 19 tons of poison AN HOUR was dumped into the Columbia River, everyday, for 60 years. The smelter found a free way to dispose of their waste and never so much as questioned the consequences their actions would have on the Columbia River, the environment, or on the health of the residents living in the small communities along the Columbia. Do you know what else I discovered in the US Agencies investigations and reports? It was just as, if not more, alarming than what I discovered Teck had done. The EPA, Ecology, DOH, and ATSDR had discovered the accumulated toxins, and knew the danger they posed to residents in the area, as far back as the mid 1980’s. However, all their investigations concluded that more information would be needed for further research, And that the area posed an “intermediate health hazard”, but residents were “most likely” not in any immediate danger. Never once did any of the Government Agencies warn, or even tell, anyone living in Northport that they had been, and continued to be, chronically exposed to multiple heavy metal toxins, through multiple routes of exposure, for decades. The DOH and the ATSDR did a human health assessment in 1994 on a small percentage of residents, because at a town meeting the community demanded they look into the health issues found in many of the residents. They took the blood of approx.. 22 children in Northport. They tested only for lead. They then spoke to the many residents suffering from Thuroid Diseases, Inflammatory Bowel Disease (Ulcerative Colitis/Chrone’s), Multiple Scoliosis, Parkinson’s Disease, Brain Tumors/Aneurisms, Brain, Stomach, Kidney, Pancreatic, Bladder, Breast, Eye Cancer and Leukemia. The ATSDR concluded that, although the amount of illnesses found was uncommonly high, further environmental investigations needed to be done by the EPA and Ecology before the DOH could proceed. Ecology completed four air monitoring phases by 1997, all four phases showed levels of cadmium to be higher than recommended safety levels, and arsenic was found to be 300 times higher than accepted safety levels. The DOH did no follow up on this information. And, again, residents were not even made aware of the results. My Father grew up in Northport, along with his siblings and parents. They all suffer, or suffered, from one of the illnesses mentioned above. The Government Agencies we count on to protect us, and defend us, let us down. They looked the other way for decades as Teck was allowed to dump 9.8 million tons of heavy metal toxins/poisons into our water, as well as the heavy metal toxins (arsenic, cadmium, sulphur dioxide) that they released into our air through their smoke stacks. Even worse, when they were backed into a corner to conduct studies on the impact the toxins had on our environment and health they looked away again. The people I have spoken to with specific knowledge on the subject believe the studies are designed to find in favor of the polluter. Especially when the polluter is in another country and a fight would cause a cross border litigation, which could back fire on the United States. Finally, in 2006, Two members of the Pakootas Colville Tribe sued the EPA for inaction. The court ordered, under CERCLA/Superfund Laws, the EPA to immediately begin a Remedial Investigation/Feasibility Study (RI/FS) and a Human Health Risk Assessment of the area. With, or without Teck Resources assistance. They needed to be sued to be forced to do their jobs to protect us. These studies are still not complete. How many lives could have been saved if they would have done their jobs correctly from the beginning? Not enough, according to Teck. An internal memo circulated among Teck management in 1982 that stated that the amount of toxins being dumped daily into the river, and specifically the recent accidental release of 6,630 pds of Mercury into the river, might pose as an issue for Teck down the line if safer guidelines were not put in place. The memo went on to say immediate action was not necessary because, currently the toxins were coming into contact with an “insignificant amount of people”. The insignificant people they are referring to are the residents of Northport. So, Teck felt that the town of Northport, with only 375 residents, was simply insignificant in the grand scheme of things. 375 fathers, mothers, grandparents, children, sisters, and brothers…they were just not significant enough. The friends and family I have lost to these diseases were significant, I promise you that. The friends and family I continue to see suffer with these diseases; giving them basically no quality of life, they are significant. So this is what led me to reach out to the CCC in 2008. Many of the resident who began this fight had passed away, or were still living with their debilitating illnesses, as they now watched their children and grandchildren being diagnosed with the same illnesses. With the assistance of the CCC, and the participation of residents, I conducted a community health survey on three generations of past and present Northport residents. From 2008-2009 I collected 321 questionnaires. The results of the questionnaires showed that, over three generations, 54 respondents had Ulcerative Colitis or Crohn’s Disease (a very rare disease), 65 respondents had one of the cancers mentioned above, 23 respondents had brain aneurysms/tumors, 8 respondents had pulmonary embolism, 9 respondents had MS, and 13 respondents had Parkinson’s disease. These are just some of the health issues that were discovered. This may seem like a somewhat small amount. But in a population of 375 people these disease rates are all considered epidemiological health clusters by the scientific community. Meaning their exposure to some environmental factor(s) were most likely the trigger of these diseases, or at least played a significant role. Since this health survey was done by residents, and not by the EPA, Ecology, DOH or the ATSDR, they had no interest in the results. Luckily, the results of the survey caught the attention of Dr. Korzenik, a physician and researcher from the Massachusetts General Hospital (MGH). He agreed to bring his assistants up to Northport, and with the help of MGH, and Harvard University, he conducted his own study on his specialty, Ulcerative Colitis and Crohn’s Disease. It bares mentioning he has done countless of these studies over the years. After months and months of walking door to door, calling, and emailing residents to complete his survey, gathering medical history, and mapping out the findings, he was ready to publish his results. He discovered that the health cluster of residents with Ulcerative Colitis and Crohn’s Disease found in Northport, WA was one of the biggest he had ever seen. It was 11.5 to 15% higher than would be expected. He also believed this could be a once in a lifetime opportunity to study these diseases that currently have no cure, and are very rare and very misunderstood. Dr. Korzenik and I shared the same hope. That once his study was published in a scientific journal we would get the attention needed to hold Teck responsible and use the suffering residents of Northport, who were more than willing, to take part in an epidemiological study on them and the area. Further studies could lead to information that could help cure, or at least prevent, people from getting Ulcerative Colitis and Crohn’s Disease in the future. We also hoped the study would attract the attention of specialists in Multiple Scoliosis, Parkinson’s, specific Cancers, etc. This little town, that had suffered over three generations was willing to let themselves be poked and prodded in the hopes to save future generations from suffering the pain and anguish they had lived with. They didn’t want money, they didn’t want the smelter to be shut down, they just wanted to help. And they wanted their Government Agencies to help them, in forcing the smelter to cut their toxic releases to the levels their permits allowed. As Dr. Korzenik worked on his study, and was shopping it around for publication, an excellent law firm from Seattle contacted me. They wanted all my research and I happily sent it on to then, along with the smoking guns…the US Agencies own published reports. The law firm believed that, along with the real evidence, provided by Teck because of the Freedom of Information Act, the US Agencies lack of investigating, and the results and publication of Dr. Korzenik’s study, these long-suffering residents had a real shot at bringing a civil lawsuit against the multi million dollar smelter. Most of the residents were not that interested in joining the class action suit. They believed that no amount of money would bring back their loved ones, or the years their poor health had stolen from them. Also, they told me again and again…”you don’t stand a chance.” They told me, Teck is a Canadian company the US does not want to get into a cross border litigation with, and their pockets are very deep. They had been fighting this fight for decades. Since the first Northport farmers sued Teck in 1933 for their air emissions killing their livestock and crops, to the groups of residents who continued the fight since. My Grandparents were a part of the CCC, and apart of that fight. My Grandpa succumbed to Leukemia and my Grandma passed away because of Parkinson’s. But these excellent lawyers believed in the case. The lawyer’s initial filing was accepted by the Court. Teck, of course, filed for the case to be dismissed. The Judge denied their request to dismiss the case, and said they would stand trial. This finally happened in January of 2015. 7 years after I began this journey, and 101 years after the smelter began using the Columbia River as their personal toxic dumping ground, and sending their toxic air emissions down wind to settle into the Northport valley. We were getting closer than we had ever gotten. However, in May of 2015 I received a call from our lawyer. Dr. Korzenik’s compelling, and undeniably groundbreaking research paper had been suddenly denied publication in any scientific journal. Without this study being published, by the scientific community, they could not go forward with the lawsuit. And although Dr. Korzenik is still actively trying to get the study acknowledged in the scientific community, the law firm had no choice but to withdrawal the civil suit and let Teck walk again. The lawyers themselves indicated to me that it was very probable Teck played a role in getting the planned publication of the study squashed. So after all the work of countless people it seems Teck wins again, for now. I did reach out to Teck and asked, since they had openly admitted in court, that they did in fact pollute the river as was reported, if they would consider funding annual check-ups, blood tests, and hair samples to monitor the heavy metal build up in residents, and to provide proactive exams to detect the diseases found in the area in residents. They declined, probably because they still refuse to admit there is any connection between the toxins they admit to dumping by the truckload for over 100 years, and the health issues found in the residents of Northport. Did I mention all the illnesses found in clusters in the residents have all been scientifically linked to chronic exposure to the heavy metal toxins Teck has admitting been releasing for decades. Please feel free to email me with any questions or ideas. Thank you for taking the time to read this! A federal judge in Yakima will decide whether a Canadian mining company must pay to clean up pollution that for decades crossed the border into Lake Roosevelt in Washington. U.S. District Court Judge Lonny Suko heard motions on the lawsuit Wednesday and said he will issue a decision later this year. The long-running lawsuit was filed by the Colville Tribes against Teck Metals Ltd. of Vancouver, B.C. The company operates a huge smelter at Trail, B.C., that for nearly a century dumped mining slag into the Columbia River. Heavy metals pollution traveled down the river into the United States at Lake Roosevelt, which is the 150-mile-long reservoir behind Grand Coulee Dam. One major issue is whether a Canadian company is subject to U.S. environmental law. John Sirois, chairman of the Colville Tribes, said U.S. law should prevail. “Where does the pollution end up? That’s where the jurisdiction should end up,” Sirois said after the hearing. Last month, on the eve of trial, Teck Metals reached a settlement in the case in which it admitted that some portion of the mining pollution in the reservoir came from its smelter. The settlement eliminated the need for a trial scheduled for September, but numerous jurisdictional and other legal issues remain. Teck is one of Canada’s largest mining companies, and its lead-zinc smelter 10 miles north of the U.S. border is among the largest of its kind in the world. State and federal authorities contend the company and its predecessors discharged mining slag into the river from 1896 to 1995. That slag then flowed into Washington, causing significant heavy metal contamination in Lake Roosevelt. A decade ago, the Colville Tribes petitioned the U.S. Environmental Protection Agency to assess contamination in the reservoir. In 2003, the EPA decided that Teck was subject to the U.S. Superfund law. The agency demanded the company pay for studies to determine the extent of the contamination and then clean it up. The tribes filed suit in 2004 to force Teck to comply with that order, and the state joined the lawsuit as an intervener. In 2009, a federal judge ordered Teck to reimburse the Colvilles for more than $1 million the tribes had spent on the case over five years. The company in 2006 reached a deal with the EPA to study the extent of the pollution in Lake Roosevelt. That study is expected to be finished in 2015. Teck contends the extent and cost of cleanup cannot be determined until that study is finished. Teck contends that study results so far have shown that water in the lake meets Canadian and U.S. quality standards, that beaches are safe for recreational use and that fish in the river system are safe to eat. © Copyright 2012 Associated Press. All rights reserved. This material may not be published, broadcast, rewritten, or redistributed. Wall Street Journal article on Northport! NORTHPORT, Wash.—Ranching families and American Indian tribes along the Columbia River here have long accused a refinery across the river in Canada of poisoning their land. In a surprise move, the plant’s owner, Canadian refining giant Teck Resources Ltd., said late Monday that its Teck Metals unit would no longer contest that it is responsible for discharging contaminants into the U.S. in a federal trial that had been set to begin next week. Instead, Teck agreed to proceed to phase two of the trial in October, which will culminate in a judge’s eventual ruling on any liability for pollution damages and cleanup costs. Teck continues to say it isn’t responsible for extensive pollution of the river. 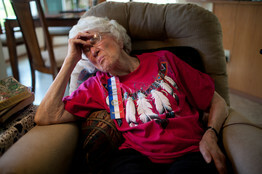 Ranching families, especially Kay Papariches and her family and their neighbors along Mitchell Road, which hugs a bend in the Columbia River, report diagnoses of cancers and multiple sclerosis that they believe came from swimming in the Columbia, and from using river water for fields and cattle. The company’s legal maneuver represents a mixed blessing for residents of this tiny border community on the U.S. side. 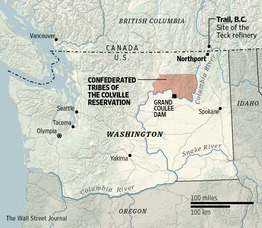 Washington state and the Confederated Tribes of the Colville Reservation had filed suit in federal court against Teck, whose sprawling Trail, British Columbia, smelter began operating on the Columbia River in 1896. The trial was set to begin Sept. 17 as the initial step in establishing any clean-up costs, and residents had hoped the trial would soon clarify the extent of any damages. While the company may eventually pay damages, any dollar amount won’t be set until at least 2015, meaning it will be three years or more before residents here know the extent of any damages. Some people here had been looking forward to seeing Teck’s alleged discharging of waste from its Canada plant examined in court, and hoped evidence in the trial would bolster their own efforts to hold the company accountable for illnesses they say have plagued families here for decades. “I hope it can at least get it stopped for future generations,” said Barbara Anderson, an artist who has lived here since 1975. Mrs. Anderson, 59 years old, believes her teenage daughter’s ulcerative colitis was caused directly by smelter heavy metals. They are not currently suing the company. In the past century, some residents complained about damage to crops from Teck’s operations, which occasionally led to small settlements. In 1941, the Trail smelter was cited in an International Joint Commission arbitration ruling that no country can permit air pollution that harms the citizens or property in another country, said Rachael Paschal Osborn, staff attorney for the Center for Environmental Law & Policy in Spokane, Wash. In this town of barely 350 residents, locals have long complained of higher-than-normal rates of certain maladies. Ranching families, especially on Mitchell Road, which runs along a bend in the Columbia River, report diagnoses of cancers and multiple sclerosis that they believe came from swimming in the Columbia, and from using river water for fields and cattle. A recent Harvard Medical School study determined that Northport has 10 to 15 times the normal rates of certain inflammatory bowel maladies such as Crohn’s disease and ulcerative colitis. “It seems like a provocative cluster,” said Joshua Korzenik, an author of the study, who now is seeking funding for a full epidemiological survey of the town’sresidents to attempt to confirm if there is a link to any pollution. Washington state health officials say the connection isn’t conclusive. Teck officials say the disease clusters could be related to family genetics and factors other than pollution from its plant. Teck’s most recent court case began in 2004, when the Confederated Tribes of Colville brought suit in U.S. court in Yakima, Wash. Their goal: to force Teck to comply with Superfund rules. At first, the Canadian company argued that the U.S. Comprehensive Environmental Response, Compensation and Liability Act, known as the Superfund law, lacked jurisdiction over a foreign company. But with the trial set to begin next week, the Canadian company switched gears. In its statement Monday, Teck said it would now stipulate that “some portion” of the slag discharged from Trail into the Columbia River between 1896 and 1995, along with “some portion of the effluent” discharged, “are present in the Upper Columbia River,” and that “some hazardous substances” had been released into the U.S. The 1.4 million-acre Colville reservation hugs one bank of the Columbia River north of the Grand Coulee Dam. For years, tribal members complained pollutants from Teck’s Canadian operation remained in sediment under Lake Roosevelt, the reservoir of Columbia River water that lies behind the dam. Monday’s news angered some residents. “Teck was afraid of the outcome of the Yakima trial. They feared if they were held liable it would have opened them up to an onslaught of civil lawsuits,” said Jamie Paparich, who grew up on Mitchell Road and now leads a coalition of former and current Northport citizens fighting for a cleanup of the river. A version of this article appeared September 12, 2012, on page A6 in the U.S. edition of The Wall Street Journal, with the headline: New Twist in Pollution Case. for great photos of Northport and the community!! Sept. 14–After years of legal quibbling, artful stalling, and averted eyes, Canadian smelter Teck Metals Ltd. acknowledged a century of using the Upper Columbia River and Lake Roosevelt as an industrial sewer. Teck Cominco, Teck Resources or Teck Metals, regardless of the corporate alias, the company admitted this week it had discharged 10 million tons of slag from its smelting process and hundreds of thousands of tons of heavy metals into the river at Trail, B.C., 10 miles north of the border. The company admits that slag and effluent discharged between 1896 and 1995 made it to the Columbia from its smelter operations, and some hazardous substances were released into the environment within the United States. The qualified confession came in the form of a legal stipulation filed Monday, a week before trial was to begin in U.S. District Court in Yakima. Moving a step ahead, the next phase of the trial, now set to start Oct. 10, will look at liability for damages under U.S. law, what must be done to deal with the pollution and how much the company might have to pay. Over the years, the state Department of Ecology has had estimates that topped $1 billion to make things right from the border down 150 miles to Lake Roosevelt, the reservoir behind Grand Coulee Dam. The company will concede that this nasty stuff has leached into the environment, but wants to argue whether it has really, really done any harm. O benign mercury. How accountability translates into pollution cleanup is a work in progress. The company, in a news release announcing an agreement “as to certain facts in Upper Columbia River litigation,” argues the slag downstream is “generally inert.” Not unlike Teck. The Canadian smelter is still pecking away on a “remedial investigation and feasibility study” that began in 2006 under the supervision of the U. S. Environmental Protection Agency. That review of environmental conditions in and around the river is expected to be finished by 2015, according to the company. No progress would be evident without the tenacious pursuit of environmental justice by two leaders of The Confederated Tribes of the Colville Indian Reservation, Joseph Pakootas and Donald Michel, who filed a federal lawsuit in 2004. They were joined by the state. The legal skirmishing is not over. Four years ago, the U.S. Supreme Court refused to hear an appeal that Teck was not subject to the U.S. Superfund law. The smelter apparently intends to recycle that argument because, golly, how was it to know all that icky stuff would end up downstream in the U. S.? Arrogance and cynicism are two additional effluvial emissions from Teck Resources Ltd. that will no doubt prove costly for the corporate treasury and stockholders as well. An environmental health advocacy group created to protect, inform, and provide a voice for the residents of Northport Washington, suffering health issues linked to decades of exposure to Teck Smelter’s pollution.